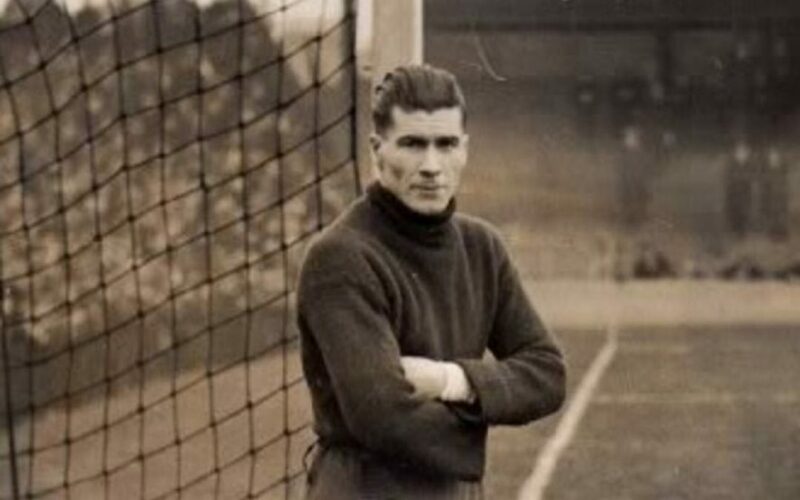 JUST after the start of the 20th century, goalkeeper Billy Scott joined Everton from Irish team Linfield. He quickly became a regular for the Merseyside club, and for the Irish national team for whom he would go on to collect 25 caps. For his club he was runner-up in the league three times and appeared in two FA Cup finals collecting one winners’ medal. 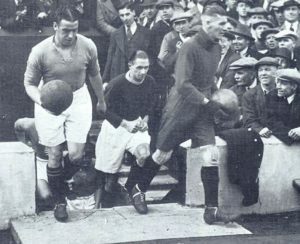 Billy also spent one wartime season appearing for Liverpool. Elisha Scott was Billy’s brother (they were a family of 10), nine years his junior, and had started his career at Broadway United before following in Billy’s footsteps and joining Linfield. Even before this, Scott had played for a Belfast Boys Brigade team and it was here that he first took up goalkeeping after berating the team’s keeper and informing him that ‘My Granny could do better than you’ (a line he would use again much later when managing Belfast Celtic). The following match team sheet was posted a week later and featured, as goalkeeper, “Elisha Scott’s Granny”. This persuaded Scott to go between the posts himself. In 1912 Billy recommended Elisha to Everton and the Toffees took him for a trial but decided that, at 19 (and with Billy still in his prime) he was too young. Instead his availability, and potential, was spotted by renowned manager Tom Watson and he joined Liverpool. Everton’s loss was most definitely Liverpool’s gain. After signing for the Reds in September 1912 a fractured wrist halted early progress and Scott then spent a short period on loan at Crewe Alexandra. When he returned to Anfield he understudied Scottish International goalkeeper Ken Campbell whilst learning his trade. Campbell had been brought in after England international Sam Hardy left the club for Aston Villa. 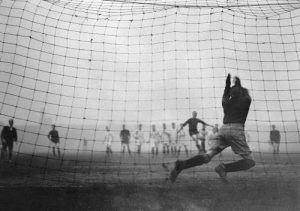 Scott made an impressive start, keeping a clean sheet on New Years Day 1913 against Newcastle United. So impressed were Liverpool’s opponents that they reportedly had a £1,000 bid for him rejected soon after. Scott had to wait 10 months for his second appearance, which came against Bolton Wanderers. It was his initial first-team appearance at Anfield and again, he impressed. One local report likened him to Billy Hardy and complimented him by saying he was ‘More promising than Hardy was at the same age’. 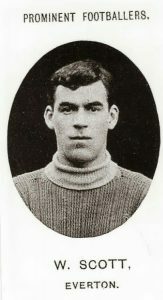 Halfway through the 1914-15 season Scott took over from Campbell between the posts and played in the final 23 games as Liverpool finished 14th. Then War broke out and top-flight football was put on hold. During the war years he returned to Belfast and spent some time playing for Belfast Celtic, winning a pair of Irish Cups in 1917 and 1918. 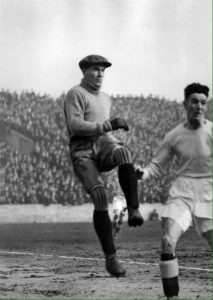 In 1919 he was back in Liverpool, Campbell stood in while he recovered from an operation but Scott took over the goalkeeper’s jersey once he was fit and Campbell was allowed to return to Scotland and join Partick Thistle. The Irishman would then keep his place, fitness permitting, for a quite amazing 15 years. It was also in 1919 that he was first called up for his country. Ireland had a ‘victory international’ against Scotland and when informed that his services were required, Scott’s initial response to then Liverpool Secretary/manager George Patterson was a disbelieving; ‘pull the other one, it’s got bells on’. It took half an hour before he was convinced it was true. Describing himself as ‘As nervous as a sheep on the way to the butcher’ before kick-off at Ibrox, he had little chance with Scotland’s first, an Andy Wilson penalty. The Irish equalised but would lose the match 2-1 after a cross came in which Scott caught before both he and the ball were bundled over the line by Wilson. But the international career of ‘Lish’ was up and running. He played in the return, a goalless draw at Windsor Park the following month, before which he was handed a shillelagh by a member of the crowd with instructions to use it on the Scottish forwards should they come close. 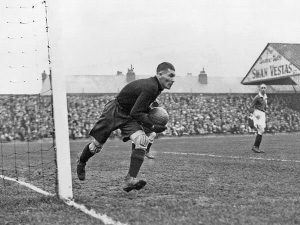 The match finished goalless, and Scott would go on to represent his country 31 times, the last appearance coming in 1936 when in his mid-40s. Small for a goalkeeper (even 100 years ago when they weren’t the giants they are today), at under 5ft 10in, Scott was extremely quick and agile (one reporter of the time described him as having ‘the eye of an eagle, the swift movement of a panther and the clutch of a vice’) and his alertness and good positioning enabled him to make difficult saves look much easier. 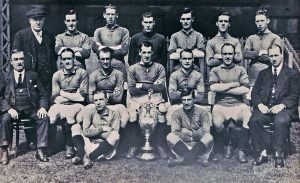 Within three years of his return to Anfield, in 1921-22, Scott was a title winner and the Reds followed up with a second crown in 1922-23. Over the course of those two seasons he missed just three games and constantly proved himself the league’s leading ‘keeper. During the first title win and for half of the second Liverpool were managed by Scott’s fellow countryman David Ashworth. Ashworth had taken an unusual route into management having started out as a referee before taking over at Oldham Athletic. After a successful spell at Boundary Park he moved to Stockport County before being appointed to replace secretary Patterson who had taken on the job when Tom Watson passed away in 1915. 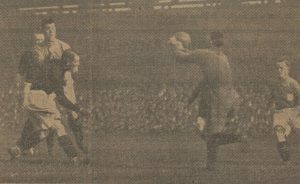 A 1923 penalty save from Arsenal’s Robert Turnbull. After a pair of fourth-place finishes Ashworth led his team to the title and they were well on the way to repeating the feat before, in December 1923 he suddenly and inexplicably left the club and returned to Oldham. Former player Matt McQueen took over and completed the job of retaining the crown. In 1928 Scott was still performing with skill for the Reds but he was now in his mid 30s and the arrival of South African Arthur Riley seemed to signal that the end of his time at the club could be approaching. The Reds turned down an offer from crosstown rivals Everton. Two years later the Toffees would try again with a £5,000 offer and this time Liverpool accepted. Apparently, an ankle injury was the only thing that stood between Scott and a move to Goodison. At around the same time the Anfield team also offered Scott, along with £9,000 to Preston North End for Alex James. The offer was accepted but James turned down personal terms and would eventually join Arsenal. Scott fought back, returned to the first team and kept his place for another two seasons although Riley was gaining more playing time. Liverpool put him up for sale at £250 and Everton came in once again. The deal looked set to go ahead before public furore and a massive newspaper campaign forced the Reds to back out at the last minute. When he did eventually leave Anfield it was to return to his homeland as Liverpool allowed him to join Belfast Celtic where he took on the role of player-manager. After his final appearance at Anfield, against Chelsea, he went up to the directors box to deliver a speech to the crowd thanking them for their support. His last words before leaving were reserved for fans as he offered his gratitude to; “My friends on the Kop. They have inspired me. God bless you all”. Dean and Scott really were great friends off the pitch. The Everton man once scored a hat-trick in a meeting between the two. “That very same evening we went out and had a couple of drinks’, Dean recalled. “And I think Elisha and I were the only two people in the city who weren’t talking football”. 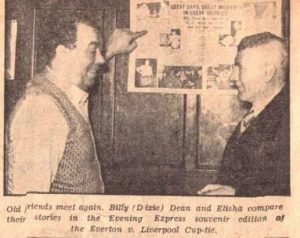 Proof of the regard Dean held for Scott on the field can be seen by this comment the Everton man made in the early 1970s; “Elisha was the greatest I’ve ever seen. You can have Swift, Trautmann, Banks, Wilson. You can have them all. I’ll take Elisha Scott”. Dean’s view was shared by Bill Shankly and a host of other contemporaries. By the time he had finished the English part of his career, Scott had made over 450 appearances in his 22 years with the Reds and had fought off numerous opponents for the goalkeeper’s jersey. His arrival at Belfast Celtic would bring more honours. He played while also managing for two more years and won the Irish League, Gold Cup and County Antrim Shield as well as representing the Irish League in their win over the Football League, before retiring and focusing solely on the manager’s role. As manager Scott enjoyed tremendous success. The club were under his leadership for 15 years and in that time they won no fewer than 10 Irish League titles, 6 Irish Cups, 3 City Cups, 8 Gold Cup and 5 County Antrim Shields. In his managerial role, Scott was known as a strict disciplinarian who demanded loyalty and high levels of physical fitness from his players, but was totally loyal to them in return. He would have ‘spies’ out on Friday nights ensuring that his players didn’t stay out drinking too late before matches (and this despite enjoying a drink himself). Sadly, due to sectarian trouble, Belfast Celtic withdrew from The Irish League in 1949. 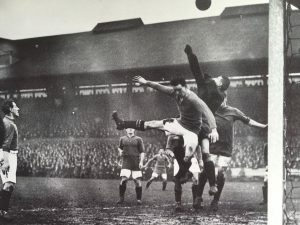 On 27 December 1948 Celtic travelled to Windsor Park to take on bitter rivals Linfield. After the match ended in a 1-1 draw fans invaded the pitch and a number of Celtic players were attacked with some suffering serious injury. Shortly after the match the Celtic directors announced that they would be withdrawing from the league at the end of the season as the safety of their players couldn’t be guaranteed. Scott, a Protestant, stayed put. The club took part in a hugely successful tour of America in the summer of 1949, which included a 2-0 win against Home International Champions Scotland in front of 15,000 fans at Triborough Stadium on Randall’s Island in New York City. 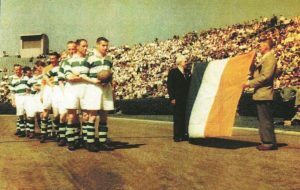 There was some controversy over Scott holding a tricolour flag during the pre-match ceremony but the manager would later say it was thrust into his hand and he took it without giving the matter any thought. The political ramifications seemed more important to others than they were to the man himself. On their return, team died but the club carried on. Scott was offered the Glenavon job and seemed set to accept before Celtic announced that they would refuse to let him leave and would continue to employ him, collecting rent on club properties and dealing with paperwork. So he stayed. In the 1950s he suffered a series of strokes and he passed away in Belfast aged 66 in 1959. Elisha Scott certainly wasn’t a one-club man. And in fact there were a number of times when he could have moved on from the two clubs he played for. But to fans at Anfield he will always be considered as a ‘Mr Liverpool, whereas those who watched their football at ‘Paradise’ undoubtedly thought of him as ‘Mr Belfast Celtic’. That, allied to the high esteem he was held in by teammates and opponents alike means that he clearly belongs among the Greats of Football.